Kevin Roberts was born in Lancaster in the north of England and attended Lancaster Royal Grammar School. He started his business career in the late 1960s with the influential London fashion house of Mary Quant. After working in senior management and marketing positions with Procter & Gamble in Europe and the Middle East, he became CEO of Pepsi-Cola Middle East at age 32. Roberts took up his position with Saatchi & Saatchi in 1997. Under Roberts’ leadership, Saatchi & Saatchi has grown revenue year by year and achieved outstanding success at the Cannes International Advertising Festival. In 2003 Saatchi & Saatchi was named Best Global Network by both Ad Week and Ad Age publications. Saatchi & Saatchi are now involved in the world of human emotions through their Lovemarks approach. Lovemarks are a new way of thinking about the things we love. Lovemarks are better than brands, because they are about Love and Respect: they speak to us as thinking and feeling human beings. Lovemarks embody Mystery, Sensuality and Intimacy. 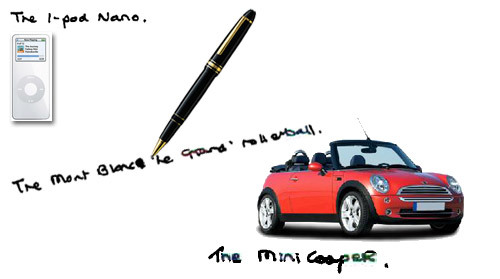 I wrote Kevin and he wrote me back with one of his own favourite Lovemarks: the Mont Blanc ‘Le Grand’ rollerball pen. To keep it as close as possible to Kevin’s emotional state, his handwriting has been kept intact. My appologies when it makes it a bit harder to read… but fun it is! The answers were received on October 17th, 2005 at 19:47 PM. In the Lovemark approach, you frequently mention the term â€œemotion(s)”. What does it refer to in this context? Where exactly do emotions â€œcome inï¿½? in the Lovemark approach? In the Love/Respect Axis, fads trends and infatuations are located in the â€œhigh love-low respect” quadrant. When a positively experienced product-emotion persuades us to purchase that gotta-have-watch, what has to happen next for the watch (brand) to win my respect and turn into a Lovemark? How much influence do you think a designer has in the creation of a Lovemark? Do the people who love these brands (Lovemarks) really own them? Because that would mean that people own their own emotions, right? Do we in fact own them in your opinion? In the Lovemarks newsletter of September it said: “To be successful, retailers will need to be “the theater of dreams”, and need to engage customers emotionally.” This â€œto engage customers emotionally” is something I read more often in pieces related to the Lovemarks. Could you explain what you mean exactly by engaging customers emotionally and how that would be made possible? When you would have to think of a product design that you think of as a true emotional design, which design would that be? On your website, in the Q&A section, your answer to what makes a great ad is: “Simplicity, relevance and an immediate emotional connection to the consumerâ€™s heart, through a stunning visual, humour, music or drama. A difference psychologists usually make between sentiments and emotions is that sentiments are dispositional, which means they are not limited in time (being afraid of dogs). They can even last a lifetime. Whereas emotions are acute and can only last seconds or even fractions of a second (being frightened by a dog in a certain moment). Would you agree that to get to peopleâ€™s hearts it could be even better to try and connect to sentiments which are dispositional rather than to emotions which are acute? And how do you think this would influence Lovemarks? For some time, emotional design in product design has been focused on the exterior and aesthetics of a product. Now we see that experience is becoming a more important factor. In creating a Lovemark, how big a factor is experience? Is there a maximum to the amount of Lovemarks that can exist in a certain market/ field? Has there been a change throughout history in how people experience Lovemarks, especially with all the changes in mass media?